It seems that gold coloured smartphones are the latest fashion statement as we have already seen the iPhone 5S in gold sell like hot cakes, and Samsung launching a similar coloured Galaxy S4 but the HTC One Gold launch won’t leave much change. 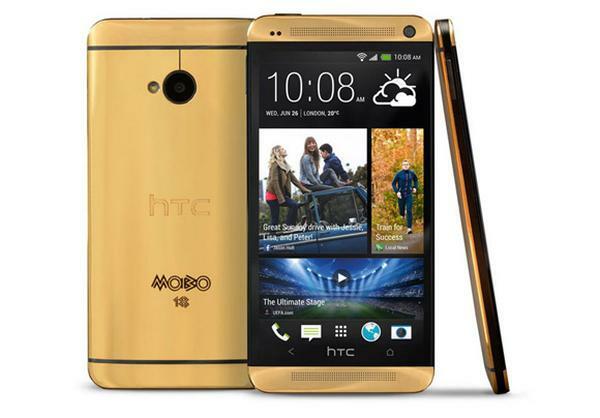 The company has announced that it has launched a new version of its flagship HTC One in the UK that is plated in 18 karat gold, and is coming to celebrate the 18th anniversary of the MOBO Awards that celebrates Music of Black Origin. Only five of these handsets will be provided with one of them going to the winner of the Best Newcomer category, and HTC are sponsoring the awards that will be taking place on October 19th in Glasgow, Scotland. According to the company the Gold One smartphones are worth a cool £2,750 which is around $4,432 and each of them have the MOBO 18 logo on the back. The device is the most expensive and exclusive smartphone ever produced by the company. The rest of the Gold HTC One uses the same hardware and features than the standard model that the less rich among us can purchase. It will be interesting to see where the other four devices land up given the exclusivity of them and of course that asking price.